You can grow almost any kind of vegetable in a container but if you are new to this method of gardening or if you want to start your first vegetable garden using containers, these eight veggies are perfect to start with. In this quick guide, you will learn what container to use for each vegetable type, how best to start it, what pests to worry about, how to harvest and other tips. We are in darkness. We are alone. They came from the lands of light. They came with torches, with lanterns, with the banners of the sun. The children of endless day—they came to banish the darkness. And they came to kill. We are the children of never-ending night. We are the dwellers of shadow. In the light of our enemy, we are dying. We were born in darkness. We must cast out the light. This is our story. Our world is broken. Our people are torn. The sun no longer rises. Evening no longer falls. In the lands of endless sunlight, we fear the darkness, we forge swords, we march to war. In the shadows of eternal night, we hide, we pray, we die. Soldiers of sunlight and children of darkness--we were once one. We were torn apart. We must be one again. We are the people of Moth. Our world must once more turn. This commemorative memorial edition of Kyle's bestselling memoir features the full text of American Sniper, plus more than eighty pages of remembrances by those whose lives he touched personally—including his wife, Taya; his parents, brother, and children; Marcus Luttrell and other fellow Navy SEALs; veterans and wounded warriors; lifelong friends; and many others. He was the top American sniper of all time, called "the legend" by his Navy SEAL brothers, and a hero by those he served on the home front . . .
From 1999 to 2009, U.S. Navy SEAL Chris Kyle recorded the most career sniper kills in United States military history. Kyle earned legendary status among his fellow SEALs, Marines, and U.S. Army soldiers, whom he protected with deadly accuracy from rooftops and stealth positions. Gripping and unforgettable, Kyle's masterful account of his extraordinary battlefield experiences ranks as one of the greatest war memoirs of all time. A native Texan who learned to shoot on childhood hunting trips with his father, Kyle was a champion saddle-bronc rider prior to joining the Navy. After 9/11, he was thrust onto the front lines of the War on Terror, and soon found his calling as a world-class sniper who performed best under fire. He recorded a personal-record 2,100-yard kill shot outside Baghdad; in Fallujah, Kyle braved heavy fire to rescue a group of Marines trapped on a street; in Ramadi, he stared down insurgents with his pistol in close combat. Kyle talks honestly about the pain of war—of twice being shot, and experiencing the tragic deaths of two close friends. American Sniper also honors Kyle's fellow warriors, who raised hell on and off the battlefield. And in moving first-person accounts throughout, Kyle's wife, Taya, speaks openly about the strains of war on their marriage and children, as well as on Chris. Adrenaline-charged and deeply personal, American Sniper is a thrilling eyewitness account of service and sacrifice that only one man could tell. A kidnapped orphan triggers an intelligence war in the Middle East, catapulting top-spy Mark Sava into a desperate race against friend and foe alike. Azerbaijan didn’t want him. And now Kyrgyzstan may not be able to handle Mark Sava either. The ex–CIA station chief has settled into a new, easy life as a spy for hire. But then his girlfriend, Daria, discovers the private intelligence agency employing Sava is connected to a strange plot involving a mysterious orphan. As Saudi intelligence agents and the CIA seek out the boy for their own ends, Sava and Daria call on old friend and ex–Navy SEAL John Decker to protect the child while they dig for the truth. Soon Sava has a front-row seat to a black ops war between the CIA, US Naval Intelligence, and foreign forces—and the boy is somehow the key to victory. Sava just wants to find the child a good home, but can he do so before his own broken past proves his undoing? I rented this movie from Amazon Prime. When I first saw the movie it was the presence of Harrison Ford that drew me in. He’s one of my all time favorite actors. 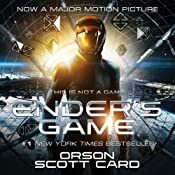 Ender’s Game is based on the book by the same title written by Orson Scott Card. The book won both the Hugo and Nebula Awards. It is now on my To Be Read list. I can only imagine the depth the book covers that doesn’t translate well to the big screen. Orson Scott Card has written five in the series and I believe this is just the first story in the series. If they make more movies I will be watching them. Yet, the story is so well done it is open for sequels and stands alone very well. In the movie we find ourselves thrust into a futuristic world where the government is breeding and training children to be soldiers. They are in search of the one that will “save us all” from the bug like race, the Formics. All in all, I really liked this movie. I’d recommend this for your older kids, thirteen and up, because it probably won’t hold the attention of the younger ones. VIRGIN by F. Paul Wilson-- She was hidden in the desert...to rest in peace. They shouldn't have disturbed her. HAUNTED HOUSE by J.A. Konrath & Jack Kilborn--People are dying to leave. WOLF HUNT by Jeff Strand-- Two thugs. One innocent woman. And one VICIOUS frickin' werewolf. EERIE by Blake Crouch & Jordan Crouch-- One scary m*****f****** house. SPEED DATING WITH THE DEAD by Scott Nicholson-- Ghost hunters at a paranormal conference stir up demons. THE FINAL WINTER by Iain Rob Wright-- The snow was just the start...of the end. Infected (Slow Burn #2) by Bobby Adair- In a late Texas summer with a virus burning through an unprepared population, an over-educated underachiever fights for his life against the atavistic brutality of the contagion's survivors. Origins (The Wasteland Chronicles #2) by Kyle West- 2060: the meteor Ragnarok has turned the world into a wasteland, and now a horrific virus is infecting the world - will Alex and his friends survive long enough to thwart the next apocalypse? The Shock (After #1) by Scott Nicholson- A massive solar storm wipes out the technological infrastructure and kills billions, and then the survivors discover that some among them have...changed. Melt Down (Breakers #2) by Edward W. Robertson- Humanity faces not one apocalypse, but two: first a lethal pandemic, then a war against those who made the virus. Sometimes it takes the threat of darkness to unlock the strength that hides within. Enter the fast-paced fantasy worlds of 4 bestselling and award-winning authors as their strong heroines learn to overcome the darkness surrounding them. Harper Madison's inability to control her extraordinary powers has gotten her kicked from countless foster homes. Shadowford Home for Girls and Peachville High are her last chance. But when evidence ties her to the gruesome murder of a Demons cheerleader, Harper discovers this small town has a big secret. Harper will do whatever it takes to get answers about her mother and her own strange powers. Even becoming a Demons cheerleader. Training with these not-so-normal cheerleaders opens up a world of beauty and magic, pressure and impossible expectations. A world where every secret hides an even darker one. Crystal's trailer-trash witch of a momma tried to teach her the spells to close the portal to the afterlife. But Crystal got too distracted by the hunk come to town to film a horror movie starring a real ghost to pay attention. Seems his movies also turn the kids who watch them into brainwashed zombies. To top it off, something from the afterlife is tempting her BFF, Bones, to betray her. All hell is about to break loose, and the fate of the world is in her hands. She really should have listened better to her momma. When Samantha Ruiz turns invisible in front of team mates on a rafting trip, she knows something's wrong with her. According to her knowledgeable friend Will, she's got a rare genetic disorder. Fearing a lifetime sentence as a lab-rat, Sam wants to keep her ability secret. But she also wants to know if there's a connection between dark Nazi experiments on others like her and her own mother's death eight years earlier. Soon though, she'll have to choose between keeping her secrets hidden and keeping Will safe. Rylie Gresham hates everything about camp: the food, fresh air, dumb activities, and other girls in her cabin. The worst part: being bitten by a werewolf. Now she's craving raw flesh and struggling with uncontrollable anger. She has till the end of summer to find a cure before becoming a werewolf herself...forever. Rylie's moved to her aunt's ranch and enrolled in a new school. But a family of hunters, Seth's, is out to stop the monster she becomes every moon. Torn between family and love, Rylie struggles to reconcile her feelings for Seth and control the wolf within while Seth fights to do what's right. But what is right -- obeying desire or duty? EXCLUSIVE! 2 brand-new releases by SM REINE and ROBERT J. CRANE that you'll find only in SINNERS & SORCERERS! Cesar Hawke wakes up with a dead waitress in his bathtub after a night of drunken partying, but he knows he didn't kill her. He works for the Office of Preternatural Affairs. He doesn't hurt people - he saves them. The cops disagree. Now he's running. He'll have to find Isobel Stonecrow, a witch that speaks to the dead, to clear his name and get his life back. He's bagged a dozen witches before. How hard can one more be? A local cop keeping order in Midian, Tennessee, Archibald "Arch" Stan lives a good but ultimately empty life. Until the drifter with a sword comes to town. Lafayette Hendricks fights things that don't die - even when shot. As demons, chaos and unspeakable evils threaten Arch's small town, he and Hendricks must join forces to keep watch on the darkness before it swallows Midian--and from there, the world. A child of both angel and demon, Laila is outcast from Hell, banished from Heaven and lost on an Earth left in ruins. Yet the armies of Armageddon, ended now in an uneasy truce set to implode, both need her. She can become the ultimate spy...or ultimate soldier. As the armies of Heaven and Hell pursue her, Laila's forced to confront the struggle between her demonic and heavenly blood that battles within her heart. Albert Shipway is an ordinary SoCal guy, an insurance negotiator who likes booze and women and never having to say he’s sorry. But a little old woman knows about the storm of broken things -- promises, hearts, families -- littering his past, and she has one heck of a recipe for supernatural revenge: a psychotic ex, a pinch of childhood fear, a life-stealing great-granddad and a notorious mass murderer who doesn't know he's dead. Albert's about to get a chance to right some wrongs. Whatever Wednesday - Progress Report. Please?